Our guide will meet you upon your arrival at Beijing Capital Airport after you have cleared immigration and customs. You will then be transferred to the hotel where you will stay for three nights. The rest of the day is free time for resting or self-exploration of the city. 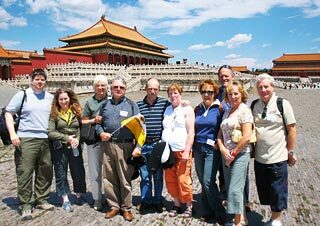 Your tour today starts at Tiananmen Square, the world's largest square in the city center. Towards the north lies the magnificent Forbidden City. Built 600 years ago, it was the residence of the royal family and the office where emperors handled all political affairs and held ceremonial activities. Nowadays, it is opened to the public as a museum where traditional Chinese architecture, cultural relics and royal families' lives are displayed. A la carte welcome lunch (valued at CNY150.00 per person and included in our price) will be at a well-known local restaurant which serves authentic Chinese food, including the famous Peking duck. The Temple of Heaven is next. It is the imperial altar for the emperors to worship the gods of heaven. The architecture here is uniquely round and higher in the northern part but square and lower in the south. This resembles the traditional Chinese idea of 'the sky is round and the earth is square'. Finally, we will end the day with a lively Chinese Kung Fu Show at the Red Theatre. 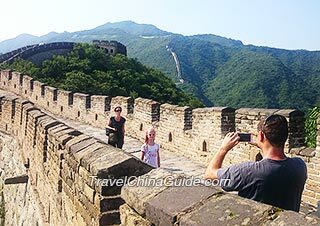 A morning excursion will take you to the Mutianyu Great Wall, which winds itself up and down across mountains and resembles a gigantic dragon. It will surely give any visitor some kind of nostalgic feelings about this world wonder. We will arrange for you the round trip cable car to go up and down the wall. Lunch is not arranged today, for there are no good restaurants in this area. Thus, our advice is having a heavy breakfast at the hotel and having some fast food around the site by yourself. One consolation, however, is that we do provide red wine for you to toast the memorable moment when you have climbed to the top of the wall. On the way back to the downtown area, we will drive by the Olympic National Stadium (Bird's Nest). The driver will make a short stop for you to take photo shoots. Before returning to the hotel, you will also have some free time at a popular local market. In the morning, you will pay a visit to the most famous imperial garden, the Summer Palace. This garden inherited the imperial gardens concept, as well as the essence of garden construction from southern China. Therefore, it boasts the majestic features of the north and the graceful charms of the south at the same time. Next, get the opportunity to take a memorable rickshaw riding through Hutongs. Feel the special Beijing culture and history by visiting the traditional narrow alleys, as well as experiencing Chinese Paper Cutting. You will enjoy a la carte lunch (valued at CNY150.00 per person and included in our price) at an elegant and decent local restaurant before your flight to Xi'an. Meet the local English-speaking guide upon arrival at Xi'an. You will be transferred to the hotel. Your itinerary today starts with the world's eighth wonder, the Terracotta Army. The museum houses the 2,200-year-old life size clay warriors and horses, as well as the delicate bronze vessels. It is believed that the first Emperor of the Qin Dynasty (211-206 BC) constructed such a large army format aimed to protect his mausoleum. The excavation work is still ongoing up to today. Around noon, you will visit a local family and be served with an authentic home cooked a la carte lunch (valued at CNY120.00 per person and included in our price). If interested, you can join our Chinese food cooking class for free and cook with the host together step by step. 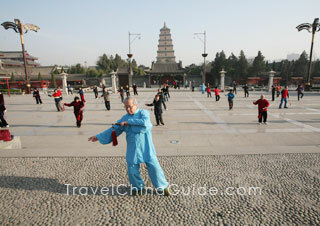 You will proceed to the Small Wild Goose Pagoda & Xi'an Museum in the afternoon. Built about 1,300 years ago during the Tang Dynasty（618-907AD, the pagoda is not only a well-protected ancient structure, but also a Buddhist architectural masterpiece. A splendid night is in-stored when you enjoy the Tang Dynasty Music and Dance Show and partake the famous Dumpling Dinner. Take a morning flight to Lhasa. The local guide will be at the airport to meet and transfer you to the hotel. The rest of the day will be free. Try adapting to the high altitude first. After breakfast at your hotel, visit the Norbulingka Park. It is also known as the 'Summer Palace' in Lhasa because successive Dalai Lamas have handled political affairs and lived here during the summer months. Wandering inside the park, you will be amazed by the unique architectural style of the Tibetan palaces. Next is the Sera Monastery. Not only can one see the unique Tibetan Buddhist buildings but also be impressed by the precious Buddhist statues, sutras and murals in the monastery. You will be dazzled by the colorful frescos painted in the halls. The Buddha statues, sacred vessels, thangkas, Buddhist sutra streamers and sutra pillars can be found everywhere. 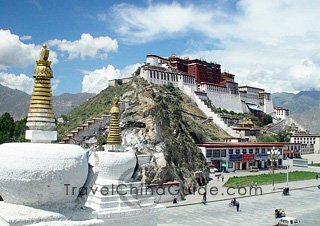 Then you will come to the Viewing Platform of Yaowang Hill located on the opposite side of the Potala Palace. It is the best spot for viewing and taking photos of the palace. Visit the Potala Palace, the highlight of our visit to Lhasa. With a history of 1,300 years, it is the most splendid building that combines the styles of Tibetan Buddhist temple and palace. The delicate cultural relics and beautiful murals in the palace will show you the glorious history and culture of Tibet. The over 59,800 square yards of colorful frescos in it are unique and wonderful. After lunch, proceed to the Jokhang Temple. Situated in the city center, the temple bears unparalleled status in the Tibetan Buddhism. The ancient temple, built in 647, is considered as a resourceful venue for visitors to learn about Buddhism. Continue to explore the surrounding of Barkhor Street, the symbol of the City. Paved by hand-polished stones, it is not a broad street but showing the original outlook of Lhasa. It could accommodate thousands of visitors daily. You will be fascinated by the old ethnic houses and various souvenirs available on this street. Finally, a visit to the nearby Nunnery will give you an insight of the Buddhist nuns. 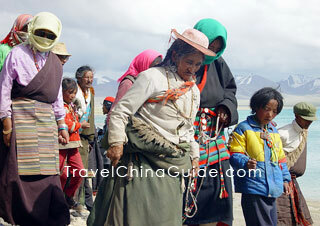 You will explore Tibet Museum this morning. It is the first modern museum in the city which boasts numerous rare collections that tell the history of Tibet, its culture and civilization. You will gain a further understanding about this special minority through the exquisite historical items and exhibits in the museum. Later, our guide will take you to the airport and help you check in for your flight to Shanghai, where you will meet the local guide and be escorted to the hotel. After breakfast, our guide will accompany you to visit Shanghai Museum, praised as the largest Chinese ancient art gallery. Appreciate the excellent collections of potteries, porcelains, jades, paintings, seals and ancient furniture in the museum. After that, continue to the beautiful Yu Garden, an unsophisticated world in the bustling city. 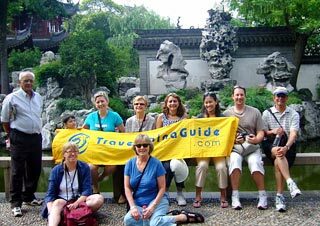 You will feast on the most elaborate man-made scenery of this Chinese classical garden and its traditional bazaar nearby. Later you will have a farewell a la carte lunch (valued at CNY120.00 per person and included in our price) at a famous local restaurant. In the afternoon, you will be escorted to the Former French Concession, the Bund and have a short cruise tour along the Huangpu River. You will also have free time to take a walk along the Bund area and feel the rapid changes of this metropolis. After that, we transfer you back to the hotel and bid farewell to you. Your wonderful escorted tour ends today. We hope you have made new friends and taken memorable photos. Please make sure you get to the airport on time as airport transfer is not included in our service. We wish you a safe journey home! 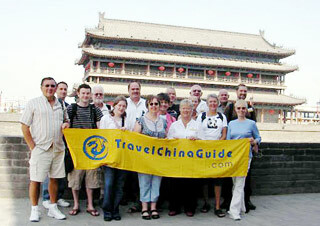 We would like to give a big thanks to Travel China Guide. We had a wonderful time and experience in China, and our tour guides and drivers were top. We will forward any information to interested friends regarding this tour and the service provided which was excellent. Thanks again for everything, and for taking us to the top of the world. Many greetings. My trip to China was absolutely great! Everything about it more than met all my expectations. And even with the delay (due to weather), we still were able to see all the things in Tibet that were most important to us. The small size of the group is really a plus. In our case, we were even more fortunate in that the 13 of us really got along great. And the mix of nationalities made it interesting. The hotels were outstanding. And the guides [Sara in Beijing, Jesse in Xian, YanZee (not sure I spelled this correctly) in Tibet, and the guide in Shanghai (sorry, I don't remember his name) not only spoke English very well but were also all very informative, personable, and accommodating. As an example, when leaving Xian, our bus broke down about 1/2 mile from the airport and Jesse got us to the airport by flagging down taxis (including some with passengers already in them!). Instead of a bad moment, it became another one of those great stories to tell about our visit! 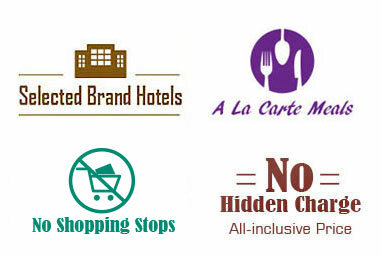 How to get from Yangtze Boutique Hotel to Shanghai Zoo? I am staying at the Yangtze Boutique hotel on Hankou Road and was wondering if there was a hop-on-hop-off tour bus close by to go to the zoo. What is the easiest way to get there? There is no sightseeing bus nearby. You can take metro line 8 from People's Square Station to Laoximen Station. Then transfer to metro line 10 to the Zoo Station, Exit 4. Afterwards, walk to the zoo directly. 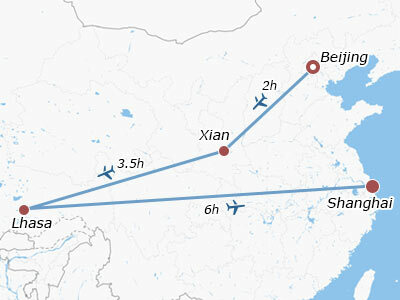 i will arrive at pudong airport around 15:00. what is the best way to go to hangzhou . You can take a shuttle bus departing at 15:00 or 16:00 from the airport to HZ and it takes around 3 hours to arrive. How can I go by subway from New World Beijing Hotel to Summer Palace? From your hotel, walk northeast around 700 meters to find Chongwenmen Metro Station. Take metro line 2 to Xizhimen and transfer to metro line 4 to Beigongmen Station, Exit D. Afterwards, walk south around 500 meters to find the scenic area. Do strangers in the same tour group share food at the dinner table? Yes, all group member will sit together and share the food at the table during the lunches or dinner included in the tour. Thank you. Is the Shanghai Happy Valley closed after 28th April 2017? Yes, it will still open tomorrow. The opening hours are from 09:30 to 21:00. Have fun!